The point of having a fire department in every town is partly to decrease the amount of time the fire truck has to travel to put out the fire. And then you have this truck, which traveled 3,700 miles to another country to help it fight its fires. 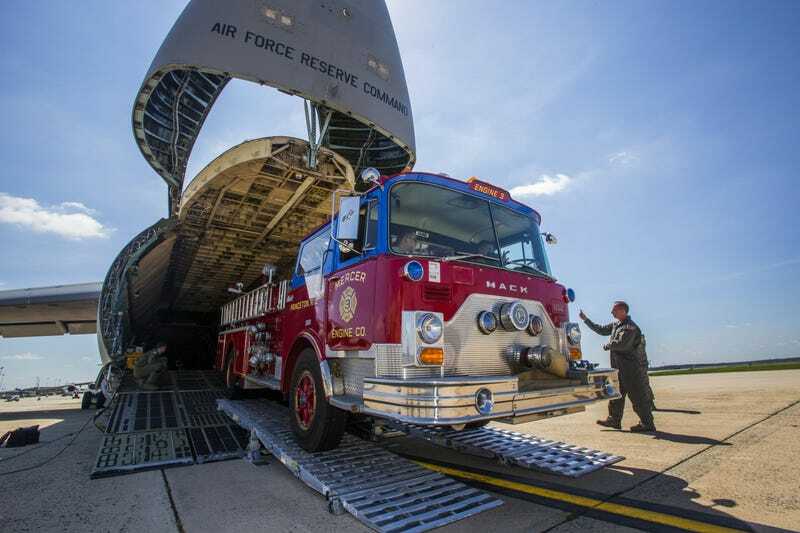 The 1982 Mack fire truck was loaded onto a 439th Airlift Wing C-5B Galaxy here Aug. 12, thanks to the combined efforts of Airmen from the Air National Guard, Air Force Reserve and active-duty Air Force, as well as a host of government agencies. It all started with Master Sgt. Jorge A. Narvaez, a New Jersey Air National Guardsman with the 108th Security Forces Squadron, who came to the U.S. in 1981 from Nicaragua. In 2014, when he visited a group of volunteer firefighters in the country’s capital, Managua, he saw that they were desperately lacking in working firetrucks and equipment. He wanted to help. In 2015, the Princeton, New Jersey fire department was told that it would have to replace its two fire trucks. One of them, the 1982 Mack 1250 GPM pumper truck, couldn’t be used anymore because the open cab was a safety hazard. Rather than just discard the truck, Navaez and other firefighters thought this would be the perfect opportunity to donate the truck to others who needed it more. To get the truck and the equipment to Nicaragua, they then needed the Denton Program. The Denton Program, which is jointly administered by the U.S. Agency for International Development, the Department of State and the Defense Security Cooperation Agency, allows U.S. citizens and organizations to use space available on military cargo aircraft to transport humanitarian goods to countries in need. Former U.S. Sen. Jeremiah Denton created the program as an amendment to the Foreign Assistance Act of 1961. Since 1998, more than 5.6 million pounds of humanitarian supplies have been sent to more than 50 countries. Narvaez got in contact with the U.S. Embassy in Managua and the necessary Air Force officials who would help plan the truck’s trip. Finally, the truck was loaded onto a C-5 Galaxy aircraft and flown the 3,700 miles south to its new home in Nicaragua.